nanjIyar highlights that madhurakavi AzhwAr speaks about nammAzhwAr firmly establishing the essence of all of vEdham which is bhAgavatha sEshathvam (being surrendered to devotees of srIman nArAyaNa) through thiruvAimozhi 3.7 “payilum sudaroLi” and thiruvAimozhi 8.10 “nedumARkadimai” padhigams (decads). nampiLLai highlights that when madhurakavi AzhwAr was asked what was the type/state of nammAzhwAr‘s mercy, madhurakavi AzhwAr says that nammAzhwAr bestowed him the confidential essence of all of vEdham. Just like nammAzhwAr revealed his gratitude towards emperumAn in thiruvAimozhi 3.3.4 “nIsanEn niRai onRum ilEn, nam kaN pAsam vaiththa param sudarch chOthikkE” (I am filled with defects and have no good qualities. bhagavAn became more radiant by showing his affection towards me), madhurakavi AzhwAr reveals his gratitude towards nammAzhwAr. periyavAchchAn piLLai highlights that when madhurakavi AzhwAr was asked why is nammAzhwAr‘s mercy greater than the whole world, madhurakavi AzhwAr says that nammAzhwAr bestowed him the confidential essence of all of vEdham without looking at his defects. Just like nammAzhwAr revealed his gratitude towards emperumAn in thiruvAimozhi 3.3.4 “nIsanEn niRai onRum ilEn, nam kaN pAsam vaiththa param sudarch chOthikkE” (I am filled with defects and have no good qualities. bhagavAn became more radiant by showing his affection towards me), madhurakavi AzhwAr reveals his gratitude towards nammAzhwAr‘s lotus feet. 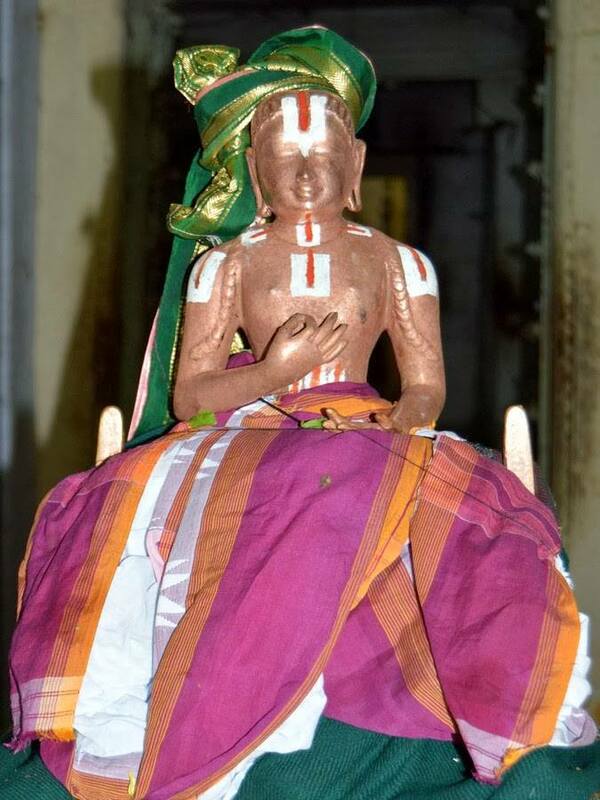 Previously madhurakavi AzhwAr explained that nammAzhwAr blessed him so that he can glorify nammAzhwAr in pAsuram 6. He also explained in pAsuram 7 that whatever hurdles/sins were there, they were dispelled by by nammAzhwAr and he said that he will speak about nammAzhwAr‘s glories to everyone. In the previous pAsuram, he explained that nammAzhwAr‘s mercy is greater than bhagavAn‘s mercy. Since nammAzhwAr‘s gyAna pradhAnam (bestowing knowledge) was discussed in previous pAsuram, in this pAsuram, madhurakavi AzhwAr explains since nammAzhwAr revealed the essence of vEdham, out of gratitude for that, serving such nammAzhwAr is the ultimate goal. In the 4th pAsuram, AchArya visvAsam (unflinching faith towards nammAzhwAr) is explained. In the 5th pAsuram and 6th pAsuram, AchArya vaibhavam (his glories) and his upakAra vaibhavam (glories of his favours/help) are explained. In this pAsuram his gratitude towards AchArya is explained. AchArya’s identity is mercy and sishya’s identity is gratitude towards the AchArya. My love/desire to serve nammAzhwAr as the ultimate goal materialized immediately, to him who firmly established in my heart the essence of vEdham, that is recited/studied by best among vaidhikas. mikka vEdhiyar – one who has great knowledge about emperumAn and great devotion towards emperumAn. vEdhaththin uL poruL – The essence/main aspect of vEdham is thiruvAimozhi. The essence of thiruvAimozhi is thiruvAimozhi 3.7 “payilum sudaroLi” and thiruvAimozhi 8.10 “nedumARkadimai” (both speak about bhAgavatha sEshathvam). niRkappAdi ennenjuL niRuththinAn – firmly established it in my heart. Like drilling a rock and filling water – so it stays well. AL pukka kAthal adimaip payananRE – Me becoming adiyEn (dhAsan – servant) means having love towards his lotus feet (Otherwise, just saying adiyEn is of no use). mikka vEdhiyar – Ones who are identified by the top-most pramANam (vEdham). Ones who have studied many sAkAs (parts) of vEdham. (Note: vEdhiyar means ones who are well versed in vEdham and ones who follow it properly). niRkappAdi – Establishing the confidential essence of vEdham which is difficult to understand/accept. thakka sIrch chatakOpan – Fitting poet (with all auspicious qualities) to glorify bhagavAn. Just like bhagavAn is most glorious/fitting as mentioned in thiruvAimozhi 1.1.1 “ayarvaRum amarargaL adhipathi” (the supreme leader of the nithyasUris), nammAzhwAr is also most fitting/complete to glorify bhagavAn. He himself says in thiruvAimozhi 3.9.11 “ERkum perumpugazh vAnavar Isan kaNNan thanakku ERkum perumpugazh vaNkurukUrch chatakOpan” (kaNNan emperumAn, the leader of nithyasUris, is most fitting to accept all praises. nammAzhwAr (me) is most fitting person to praise bhagavAn). en nambikku – one who is most complete to accept me and reform me. anRE – immediately. For the desire in bhagavath vishayam to be fulfilled, one has to go through archirAdhi gathi (the route that takes one up to virajA river) and reach paramapadham to serve him eternally/fully. But in nammAzhwAr‘s vishayam (case), madhurakavi AzhwAr attained the result immediately without any delay and without having to go anywhere else. For nammAzhwAr, the desire started in 1st pAsuram of thiruvAimozhi and he attained the full goal after 10.10 “muniyE nAnmukanE” padhigam (which is at the end). This vyAkyAnam is mostly based on nampiLLai‘s vyAkyAnam. mikka vEdhiyar – pramANa srEshtam (top-most of authentic scriptures). As heard from nammAzhwAr in thiruvAimozhi 1.1.7 “uLan sudarmigu suruthiyuL” (one who is present/explained in most radiant vEdham). vEdhaththin uL poruL – vaidhika sAsthram determines that vEdhAntha rahasyam (praNavam) establishes that bhagavath sEshathvam (servitude towards bhagavAn) extends ultimately up to thadhIya sEshathvam (servitude towards devotees of bhagavAn). mikka vEdhiyar – vEdhiyar means one who ignores bhAhya sAsthrams (literature outside vEdham) and are fully faithful to vEdham which is nithyam (eternal – beginning-less) and nirdhOsham (blemishless). They fully understand that nAradhIya purANam 18.33 “vEdhasAsthram param nAsthi” (there is no sAsthram other than vEdham or there is no sAsthram higher than vEdham) and thiruchchantha viruththam 72 “vEdha nUl OthuginRathu uNmai allathu illai” (vEdha sAsthram talks about nothing other than truth). mikka vEdhiyar means one who is not bewildered by insignificant goals and understands that bhagavath kainkaryam is the ultimate goal. One who fully understands that to attain such goal bhakthi and saraNAgathi are the two means. vEdhaththin uL poruL – vEdhapporuL (meaning of vEdham) is bhagavAn as explained by bhagavAn himself in gIthA 15.15 “vEdhais cha sarvair ahamEva vEdhya:” (vEdham fully speaks about me only). periyAzhwAr says in periyAzhwAr thirumozhi 2.9.6 “vEdhap poruLE vEnkatavA” (Oh srInivAsa! you are the object of vEdham) and in periyAzhwAr thirumozhi 4.3.11 “vEdhAntha vizhupporuL” (the inner meaning of vEdhAntham). uL poruL (inner meaning) is to understand the glories of bhAgavathas which is explained in thiruvAimozhi 3.7 “payilum sudaroLi” and thiruvAimozhi 8.10 “nedumARkadimai“. niRuththinAn – (nammAzhwAr) firmly established it. Even if he himself tries to shake it up, my faith will not change. ennenjuL niRuththinAn – Established in my heart which would not even understand the glories of bhagavAn – he made me realize the glories of bhAgavathas. mikka … niRuththinAn – He has done so much favour that he sung the essence of vEdham in thiruvAimozhi and he made me understand the meanings of thiruvAimozhi. Only for the ones who understand the glories of ones AchArya, one will understand the meanings of vEdham. nammAzhwAr established the glories of pramANam (vEdham), pramEyam (vEdhapporuL – bhagavAn), pramAthru (mikka vEdhiyar) and abimatha vishayam (nammAzhwAr who is most dear to madhurakavi AzhwAr) in the heart of madhurakavi AzhwAr. thakka sIrch chatakOpan en nambi – ones completeness is revealed by clearing limitations of others and making them complete. nammAzhwAr removed my ignorance and made me fully realize the important aspects. He is not thirukkuRungudi nambi who is glorified in thiruvAimozhi 5.5.5 as “thakka kIrththith thirukkuRungudi nambi” (most glorious thirukkuRungudi nambi emperumAn), but he is thirukkurukUr nambi (most glorious nammAzhwAr of AzhwAr thirunagari). nammAzhwAr‘s nambi is thirukkuRungudi nambi. madhurakavi AzhwAr‘s nambi is nammAzhwAr. adimaip payananRE – First, one should become a servitor to AchArya, develop love/attachment towards him, and serve him as much as possible. These 3 are desired in a sishya (towards his/her AchArya). nammAzhwAr preached bhagavath sEshathvam (being a servant of bhagavAn), bhagavath prEmam (love towards bhagavAn) and sEshathva vruththi (kainkaryam/service towards bhagavAn). But madhurakavi AzhwAr desired for these towards nammAzhwAr. nammAzhwAr eliminated worldly desires and showed bhagavAn. madhurakavi AzhwAr eliminated bhagavAn and served the lotus feet of nammAzhwAr. This entry was posted in kaNNinuN chiRuth thAmbu, mudhalAyiram on February 13, 2015 by Sarathy Thothathri.